Looking for the best barbershop software? Running and managing a barbershop is no easy feat – you have to jot down bookings, regularly check you inventory levels, manage your statistics and stay in touch with clients. In other words, you have your hands full. However, with an easy to use barber software solution, many of these tasks are made automatic. That solution is Versum – a web-based application that works across all platforms and gives you all the tools you need to streamline your daily work, save valuable time and gain more loyal customers. When it comes to booking clients, convenience is everything, and customers should not have to jump through hoops in order to book a visit. Make it easy for them and implement Versum’s 24/7 online booking feature. Link your barbershop booking site to your Facebook page or your website and watch as customer appointments fall directly into your calendar, even after hours or when you’re with a customer. To top it off, Versum scheduling software is the perfect online business card, where you’ll be able to present your services, work portfolio, employees and above all, flaunt all the positive reviews that were received from your clients. Versum isn’t just scheduling software. The system is ideal for reminding clients of their bookings. Send automatic appointment text and email reminders, which can help you to reduce no-shows by up to 70%! Additionally, Versum allows you to schedule set-and-forget email and SMS campaigns that will help you stay in touch with your customers and at the same time promote your latest services, offers or events held at your business. Staying in touch with your clients is the perfect way to turn walk-ins into regular customers. 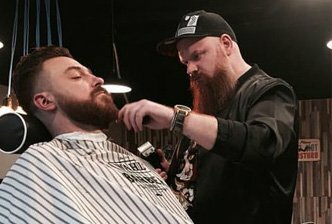 As you probably know, your customers visit the barbers for more than just fades and beard trims – they go there to relax! To provide them with the best experience possible, try Versum, barber software! The system collects and stores all vital information on your customers, including: personal details, full appointment history, preferences, as well as before & after pictures. The next time your customer walks in, have their favourite warm towel steaming and a their fresh cup of coffee ready. It is thanks to such excellent customer service that clients choose your barbershop over competition, and with Versum, everything you need to know to better service clients is in one spot. For most barbers, retail and backbar products are vital for their success. From pomades and gels to waxes and beard oils – every product needs to be regularly checked. Imagine a client booking a nasal waxing service, only to arrive at the barbers and be offered another treatment, because there is no more wax. Avoid such situations with Versum barbershop management software. The system lets you track your product sales, deliveries, levels and stocktakes. Additionally, the system allows you to predict future product usage and let’s you know when your stock levels are low. This way you never run out of backbar and retail products, saving you money and maximising sales opportunities. The entire salon in your pocket! – this is how the Barbershop “Kopytek” team sum up in one sentence the Versum salon management system. Would you like to know why? There are many reasons, however, we are most appreciative of the system’s remote access functionality. Then, there are options for managing the employee roster, services, visits, the stock and vouchers. A professional barber should utilise professional tools to optimise efficiency, and well-developed barber shop software will do just that. Work more smoothly and better manage your daily tasks with Versum!